Traditional Maltese boats bob in the harbor of Marsaxlokk. So I must remind myself, as Charlie, a ringer for Robert DeNiro, steers us down a spine-jarring Second World War-era runway—complete with the original asphalt, judging by the potholes. “This tour is like a medical exam,” my guide says, his sunburned face etched with a wicked grin. “If you survive it, you know you’re in good health.” And like some medical exams, your backside might be a bit sore afterwards, I reflect with a wince. But Charlie, a driver for Captain Morgan Cruises Jeep Safaris, is unperturbed. “We give you a free massage,” he quips, shouting over his shoulder to a German couple hunkered down on buttocks-bruising benches in the open-top flatbed. They smile and nod blankly, teeth clattering. 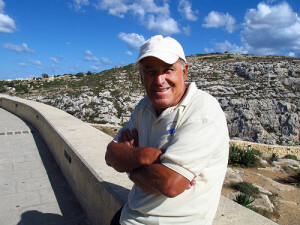 As the only other passenger on this daylong tour, I’ve claimed shotgun, both to avoid being wind-whipped and whiplashed in the back and to glean more about this sun-soaked Mediterranean archipelago from one of its native sons. “I was made in Malta, many years ago,” says Charlie, who keeps up a non-stop commentary on everything from how to prepare the wild herbs and capers that grow on the dusty slopes to the quirky Maltese tradition of painting a false clock on their church towers. “They say it’s to confuse the Devil about what time the functions begin,” Charlie explains. “But the Devil is wise. He bought the digital clock,” he cackles. 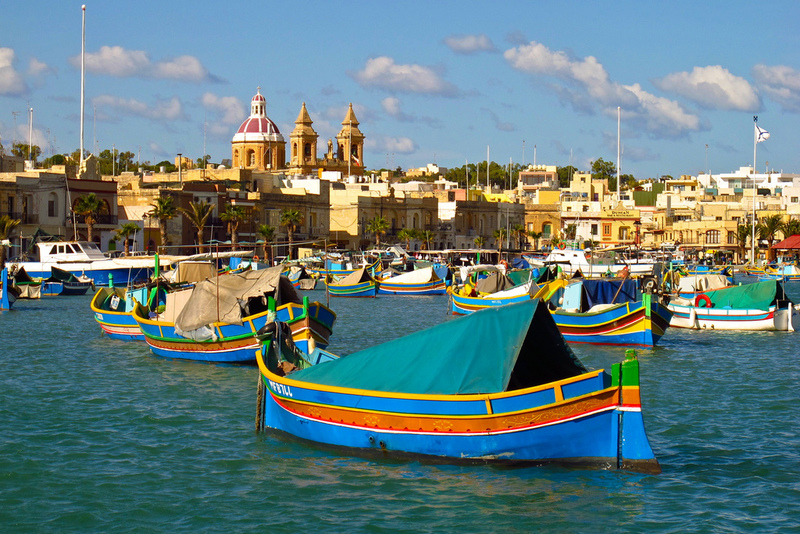 The Republic of Malta, with around 400,000 residents, covers just 316 square kilometers of land. It encompasses three main islands, including the whale-shaped Malta, which I’m exploring today. Malta was under British rule for 150 years, and as a pivotal Allied position, it endured thousands of air raids during the Second World War. But the islands are most closely associated with the Knights of St. John, who settled here in 1530 after being kicked out of Rhodes. 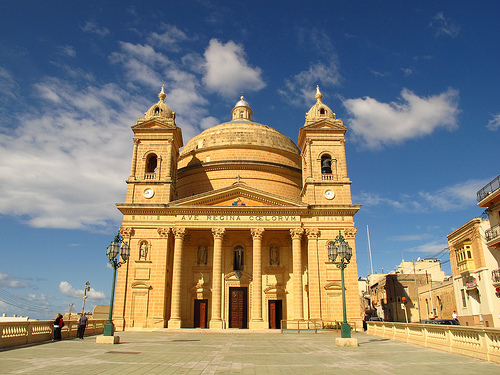 They built a new capital city, Valletta, and fortified strategic sites along the coast. 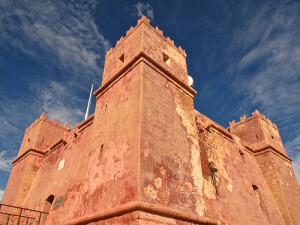 Our first stop is Marfa Ridge at one of the knights’ former keeps, the forbidding-sounding Red Tower (although it’s actually more bubblegum-pink), which provides views north across a sparkling sapphire-blue channel towards Malta’s sister islands: Comino, population three, and rural Gozo, with about 30,000 residents. The landscape is scrubby and mostly flat, crisscrossed by stone walls to protect terraced fields against persistent winds. “I have a sister in Toronto, and when I visited, she asked me to go with her husband to buy some stones to put in the front yard. I find that strange,” Charlie says, shaking his head as he surveys a vista that is almost nothing but stones. The arid landscape and hot dry summers are perfectly suited to those in search of sun and sea, but Malta is also popular with moviemakers. 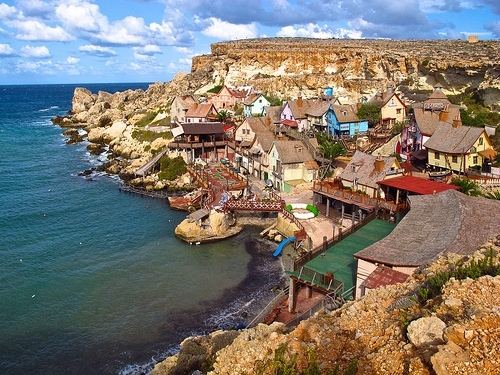 It has stood in for the likes of Egypt, Israel, Istanbul and…Popeye’s village. Charlie pulls off the side of the road to point out a colourful collection of tumbledown shanties in a horseshoe-shaped cove—the set for the 1980 “Popeye” flick. “No one lives there,” he says—although I do a double-take when I spot Popeye and Olive Oil lookalikes amid the otherwise deserted streets. They’re apparently employees of an amusement park that boasts kiddie rides and, inexplicably, free wine-tastings. (On second thought, maybe complimentary alcohol should be mandatory for over-21s at every theme park, to help the adults dull the pain). We carry on, taking a moment to dip our toes in the surf lapping at the aptly named Golden Bay, where scenes from “Troy” were filmed. 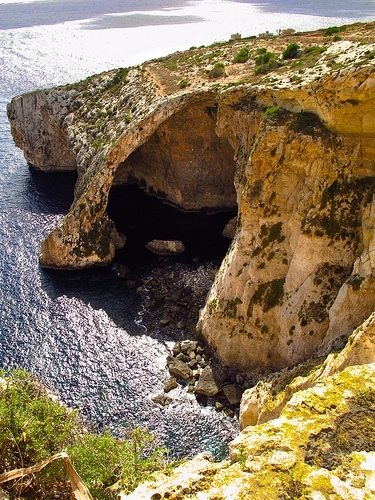 We’ll also take a spin past the dramatic Dingli Cliffs, pausing for a peek at the wreckage of a jeep crushed on the rocks below, and pause to snap a photo of the Blue Grotto, a massive cave carved by millennia of wind and waves. A highlight is our stop in Marsaxlokk, where boats painted in rainbow shades bob in the bay and a man with a mandolin plays Beach Boys tunes as tourists and locals buzz around the fish market like flies. 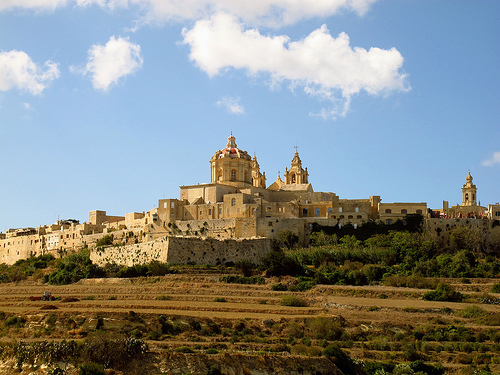 But my favourite attraction is inland—the ancient walled city of Mdina, a complex, M.C. Escheresque vision of golden stone propped atop one of Malta’s few hills. Only the city’s 200 residents are permitted to drive inside, so Charlie leaves me and my German companions at the gate, allowing us time to explore its labyrinth of silent streets on our own. It’s unnervingly quiet, especially given the fact that Malta is one of the world’s most densely populated—and religious—countries on the planet, with a population that’s 98 percent Roman Catholic. Even the horse-drawn carriage in a sunlit square is empty. Where IS everyone, I wonder, feeling a pang of panic. Did I miss the Rapture? Then I spy an elderly nun, hobbling towards the sunlit façade of St. Paul’s Cathedral, and I realise, with a sigh of relief, that I haven’t missed the boat to Paradise after all. Rather, I’ve found it, via the most unlikely of vehicles. Either way, I’m not sure what that says about my health. 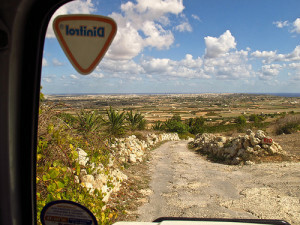 Captain Morgan Cruises’ Jeep Safari Malta, www.captainmorgan.com.mt. Touring: For additional off-road adventure, take a Segway tour of the Dingli Cliffs. 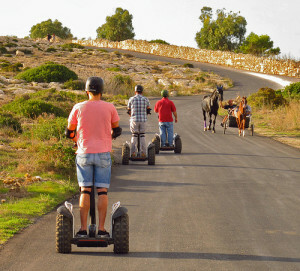 www.segwaymalta.com. If you care for a bit of culture, St. John’s Co-Cathedral in Valletta is jaw-droppingly ornate, with nearly every surface encrusted in gold or marble, and it houses two of Caravaggio’s most famous paintings: “The Beheading of St. John the Baptist” and “St. Jerome Writing,” www.stjohnscocathedral.com. The islands also claim the oldest freestanding manmade structures in the world—megalithic temples reminiscent of Fred Flintstone’s holiday home, dating back as far as 3600 BC. www.heritagemalta.com. Travel planning: You can book your holiday with www.maltadirect.com. Amy Laughinghouse, January 30, 2014. 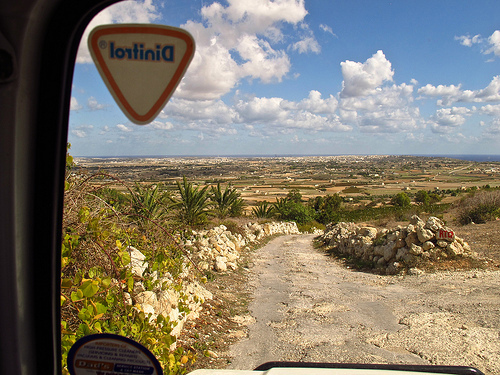 No Comments on Explore Malta on a Mediterranean Jeep Safari. Category: Europe, Islands and Beaches. Tagged: Blue Grotto, jeep tours, Malta, Marsaxlokk, Mdina, travel.